Vacation rental duplex. 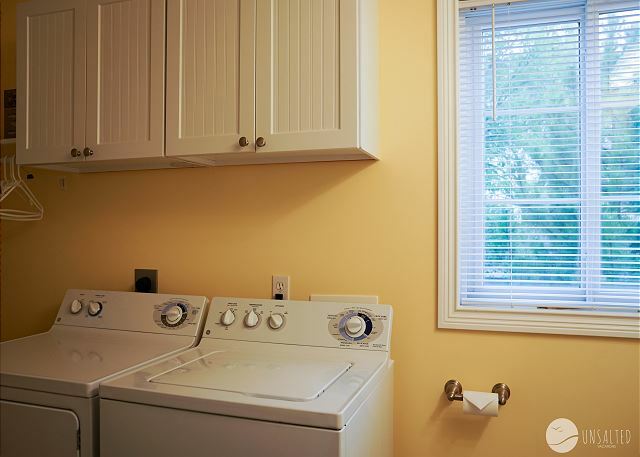 Sleeps 11, 3 bedrooms, 2.5 bathrooms. No pets allowed. Kitchen and dining room area with seating for 6. 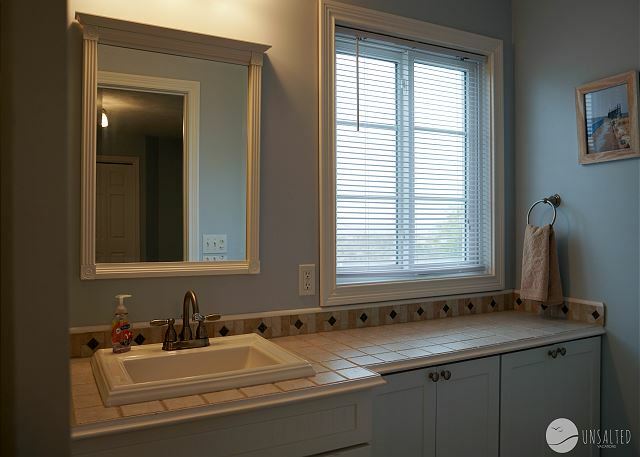 Master bathroom with Lake Michigan views. Basement rec room with two bunk bed sets. Basement rec room with bunk beds . Front of building looking out towards the beach. Fire pit on east side of building. Amazing sunsets from 5th Avenue Beach, or from your front deck! Outdoor space with gas grill. Beautiful, spacious, and ideally located home directly next to the beach and along side the harbor. Sits just next to the beach to the west, and right next to the harbor on the east. Huge second level deck overlooking the lake. Spacious and bright floor plan with huge master bedroom upstairs. Two bedrooms with twin beds downstairs, and two sets of bunk beds to sleep 10 in beds and two on a pull out couch if desired. 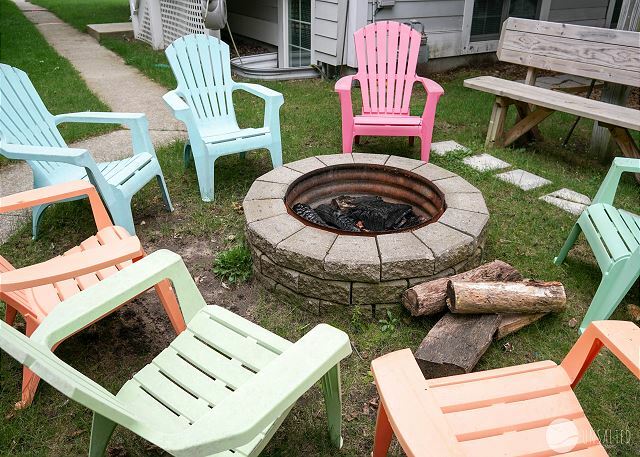 Outdoor space includes gas grill, fire pit, and picnic tables with plenty of seating. 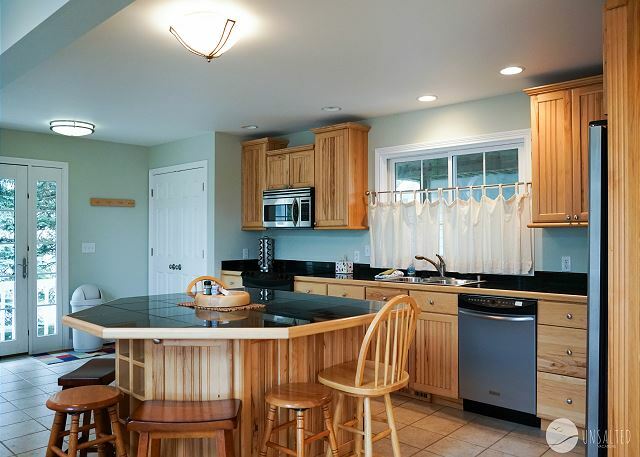 Immaculate and clean, Manistee Beach House Unit B is the perfect place for your family vacation! 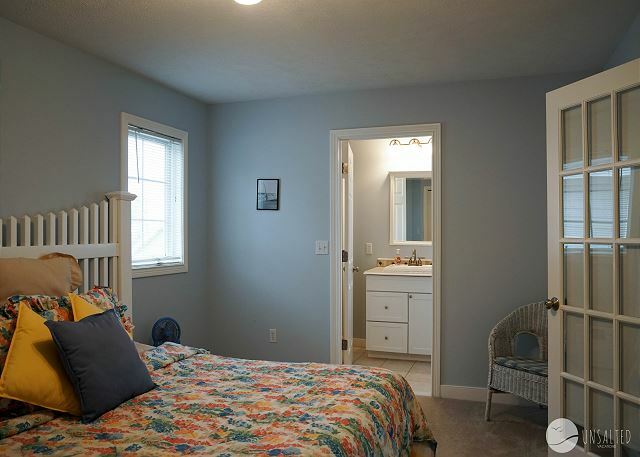 Also available is Manistee Beach House Unit A (separate VRBO / Homeaway listing #4461445) which sits directly in front of Unit B and can accommodate another 8 in beds. Boat slips are available for rent as well in the harbor with super easy and quick access to Lake Michigan, or to the Manistee River and Manistee Lake to the east. 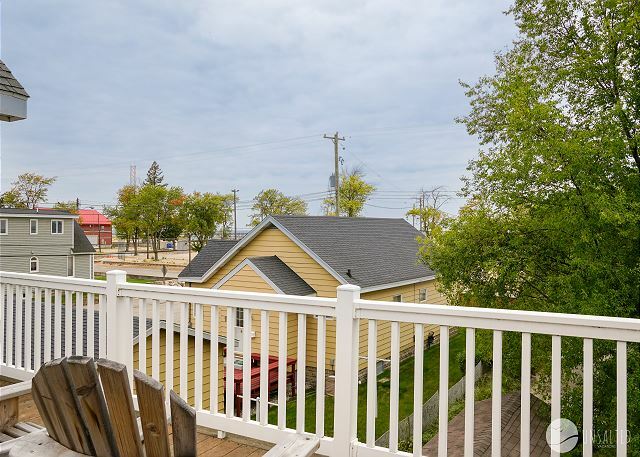 5th Avenue beach has a playground, hundreds of feet of sandy beach, a bathroom house with a snack bar, and sits directly adjacent to the pier and lighthouse, all just outside of this property. Between the two units you can sleep up to 19 people, so it's the ideal location for a family gathering or traveling with multiple families. Our group got very lucky, the weather was great for walking and playing on the beach! Our biggest disappointment was the tiny TV. The rental really needs a larger one. The rental was clean and adequate sleeping for our group. The rental process was very easy. The documentation provided answered almost all of my questions, and my emails with additional questions were answered quickly. 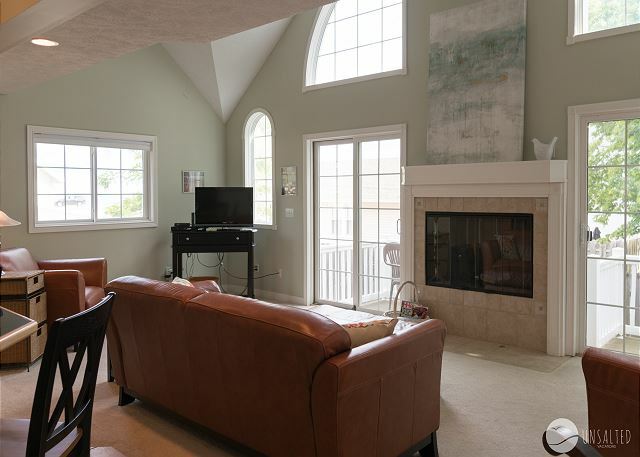 The location of this condo is perfect - so close to the beach. Very comfortable for several people. The condo was very clean. We stayed here a few years ago - noticed a few signs of aging like a dripping faucet and an older dish washer, but nothing that impacted our vacation. I would stay here again, and would recommend this condo to others. Manistee has some great restaurant options now. The Blue Fish is excellent. We also enjoyed the Filmore. The atmosphere at the brewery was fun. We also enjoyed the Pink Lotus on 31. It doesn't look fancy, but all 5 of us liked our meal. Hi Sue - so glad you enjoyed your stay! It's hard to beat that view and that location. We hope to have you back again soon. We rented the Manistee Beach House units A&B. The location and amenities are wonderful. Walk across a non busy street and you are on the sands of Lake Michigan! We had a wonderful time in clean, well managed homes. Couldn't have asked for more. 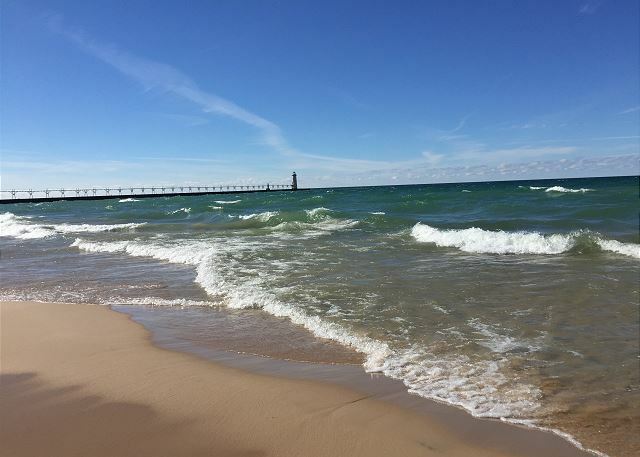 Hi Bonny - so glad to hear you enjoyed both sides of the Manistee Beach House! It's impossible to beat that location, it makes for a great vacation destination! Thank you for staying with Unsalted Vacations, please come back and see us again soon. Terrific Customer Service, Terrific place! Beautiful, modern, super clean and Unsalted was there whenever needed. We loved our stay so much we already booked for next year. Hi Carol - thank you so much for the kind words and we are thrilled to hear that you enjoyed your vacation at the Manistee Beach House! We look forward to hosting you again next year. Hi Lydia - we are glad you enjoyed your stay. Thank you for the feedback on the tvs, we will pass this along to the property owner. Please come back and see us again soon. Great home for a large group. Hi Heather - thank you for the review, and we are happy to hear that you enjoyed yourselves at the Manistee Beach House. Please keep us in mind in the future. Thanks to Aaron and Madelyn at Unsalted Vacations for saving our vacation! They did everything possible to make our Manistee week a success! Thank you!! We WILL rent from them again!! We're so glad you had a good time at Manistee Beach House (Unit B). Hope to see you again soon!